Per Mertesacker from Werder Bremen to Arsenal Arsenal don’t need one defender, they need three or four. The Gunners should also be in the market for a midfielder and probably a striker as well. So we could see a busy day at the Emirates Stadium on Wednesday if Arsene Wenger finally decides to improve an unbalanced squad. One player he should tie up is Mertesacker, an experienced centre back who will add solidity to a back line which has looked extremely shaky this season. The tall German international is great in the air and also has the necessary ball skills to build from the back. Diego from Wolfsburg to Atletico Madrid A few seasons ago, Diego was one of the most talented attacking midfielders in the world. After a couple of indifferent seasons at Juventus and Wolfsburg, his stock has fallen but he is still a good buy for any major club. The Brazilian has great close control and still possesses the skills necessary to unlock any defence. He’s still only 26 and would love to have a couple of great years leading up to the World Cup in Brazil. Atletico have been negotiating with Diego and Wolfsburg for a couple of weeks now and since Felix Magath isn’t desperate to keep him, a deal should be done. Sebastian Coates from Nacional to Liverpool The young Uruguayan centre-back really impressed me at the Copa America. Standing tall at 1.99m, he is an imposing figure and seems ready to make the leap to European football. Liverpool definitely need some cover for Daniel Agger and Martin Skrtel who have been irregular and often injured. Coates would be a great fit in a young team that is definitely getting more and more pieces which will allow them to contend for major honors for years to come. Fernando Gago from Real Madrid to Roma Many people have forgotten about this classy central midfielder who was once compared to Fernando Redondo. Gago has suffered various injuries which have hampered his progress in European football and which have limited his first team opportunities at Real Madrid. He is still a solid player and will add some steel to a Roma team that is in a rebuilding phase right now. The Argentine international will probably join on loan with Roma getting an option to buy him at the end of the season. Could be one of the bargains of the summer. Alvaro Pereira from FC Porto to Chelsea Another South American player is on the move. Uruguayan wing back Pereira is keen to meet up with his former coach at Porto and a deal could be done in the next few hours. Pereira can play anywhere on the left and is a similar player to Fabio Coentrao and Gareth Bale. He will add some speed and skill to a team that needs these attributes desperately. Villas-Boas has been working the phones trying to get his former club to let Pereira go. He would probably take Florent Malouda’s starting position in Chelsea’s starting XI. Daniele De Rossi from Roma to Manchester City The talk surrounding what would be a surprising move for De Rossi has intensified in the Italian press over the next couple of days leading me to believe that this deal could happen. De Rossi has been at Roma his whole career but after a couple of disappointing seasons, he could be looking for a change of scenery and the club could be tempted to cash in on their inspirational yet confrontational midfielder. A transfer worth $35 million has been rumored and he would be a great addition to a Manchester City side becoming better and better every day. Lassana Diarra from Real Madrid to AC Milan Lassana is one of my favorite defensive midfielders in the world. He can tackle, he can pass and he makes people around him better. He didn’t really fit into Jose Mourinho’s master plan at Real Madrid but that doesn’t mean there is anything wrong with him. He has played at a lot of clubs in a short period of time but might find a permanent home in Milan. The Rossoneri have lost Andrea Pirlo to Juventus and Mathieu Flamini to a serious injury so they need some bodies in midfield. Diarra would be an excellent signing. Wesley Sneijder from Inter to Manchester United This transfer has been talked about all summer long and it could still happen. Do I expect it to? Honestly no, but it would be a match made in football heaven. Sneijder would add the one ingredient which Manchester United are still missing – creativity in the centre of midfield. The Red Devils have everything else and they would genuinely be able to challenge Barcelona and Real Madrid with the addition of the Dutch master in midfield. For Inter it would be a huge loss but with Sneijder seemingly ready to make a move to the Premier League, Massimo Moratti could be tempted to let him go for a fee in the region of $60 million. I wouldn’t let him go for anything less. Kaka to ??? It is a shame to see a player as talented as Kaka sitting on the Real Madrid bench. He showed everyone what he could still do just this past weekend by scoring a great goal against Zaragoza and the Brazilian playmaker must be wishing that a big club comes in with a last minute bid to take him away from Madrid. He has been linked with Milan, Tottenham and Arsenal and every time he has come out and said he is staying at Real. As much as I am sure he is committed to the cause at the Bernabeu, I am also sure that he would love to be a star again. why on earth does everyone keep saying mertesacker played for dortmund???? It will cost Chelsea £50 Million plus Dan Strug or Torres. Sorry Pedro. Modric to Chelsea was never going to happen and it's not happening now. Several sources in the media and sources within both clubs have said it's a dead issue. Do try to keep up dear boy. Daniel Levy should cash in on modric and use the money for two other qulity signings at the deadline, that I think will be better for the team. 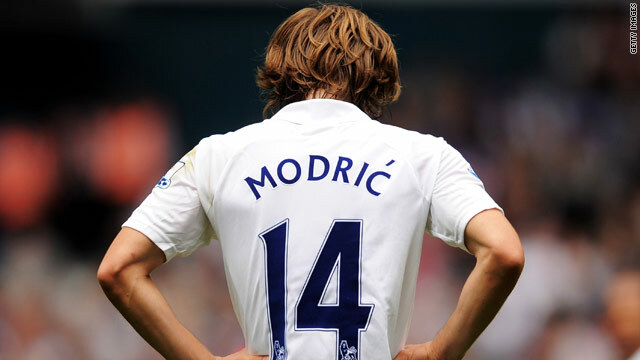 Spurs should allow modric leave cos its not about playing the game,but enoying ones self while doing it.We all know luka's mind has left the White heart lane for stamford bridge from the first day chelsea threw in a bid for him.he's no longer happy playing for spurs then they should allow him join a club of his choice.